Government propaganda is now reaching surreal levels. Anyone awakened to the plans of the globalist new world order understands the context of the accelerated multi-phased propaganda. However, the masses still watching and believing mainstream media news still seem clueless to what is really happening both domestically and abroad. Or are they? Despite the disparity of the awareness many of us get the sense that many of the clueless are perhaps becoming at least less clueless with every day that goes by. Perhaps this is wishful thinking or optimism but I get the feeling this might be the case. Why? Because the empire is becoming more and more daring with every day that goes by. With every day we are seeing the big government challenge basic human values, ethics, common sense, logic and reason. Because of their desperate overreach, this overall scenario may contain a silver lining in terms of human awakening, however looking at the recent pro-vaccine hysteria the more frightening reality staring us in the face may be this- The vaccine propaganda is spinning off in its own bizarre direction and is now quietly cementing itself as one of the most powerful tools to be potentially used to implement tyranny and depopulation consistent with the globalist plans for a new world order outlined in the Georgia Guidestones. One thing I've learned about the Obama administration's tactics is that when they need something really bad they summon Hollywood into the game. In case anyone is not paying attention, look for this sign. How many times have we seen Hollywood jump into the show in the last several years when they (the administration) is bent on pushing a specific agenda? From David Keith appearing on Steven Colbert show to sell geoengineering to the viewers, to director James Cameron selling global warming/climate change in a Showtime TV show, to Hollywood producer Kathryn Bigelow rolling out 'Zero Dark Thirty' to the sell the Bin Laden death hoax, to the post Sandy Hook false flag Hollywood gun control infomercials, to now the ridiculous Jimmy Kimmel "anti-vaxxers" spoof video attacking anyone who DOESN'T want to be forced (ie anyone who wants to make a personal choice about what goes in their body) to vaccinate their children with the (still largely unproven for safety) Measles vaccines (as is confirmed on its own insert). Despite this basic medical conclusion, apparently worth a clearly-posted warning on the vaccine's own insert, Kimmel was apparently told to push the pro-vaccine propaganda to protect profits. All profits and corruption aside, the more concerning issue is how this new wave of pro-vaccine propaganda is now setting the stage for what could be a very ugly and horrific end-game scenario here in the U.S. as depopulation and true tyranny now becomes exponentially more realistic and well within reach of the controllers. There are many red flags in this march toward medical and total true tyranny that should concern everyone. One being, whatever happened to all those left wingers who used to tell us about how abortion is all about CHOICE and freedom of choice over your own body? Wasn't that the number one argument Liberals used all these years to justify their position on abortion? Great argument in my opinion, at the very least in some cases. Women naturally have the right to choose what they will do with their own body. What a concept! But, where are those voices today? Where are the angry Liberals defending their bodies against forced vaccinations?? This form of silence is a red flag that should concern anyone who cares about American and freedom. Isn't freedom of choice, especially when it comes to your OWN body at the root of being an American and the general concept of freedom. If freedom means anything at all, isn't the choice of who you are and what you do to yourself at the heart of it all? How can a "government" under any circumstances, especially here in America, fathom that forceful anything is freedom? Whoever said that we as a people are through with pursuing freedom? Are we to discard our history, values and beliefs because a few tyrants in control feel that freedom is no more? Many of us are fully awakened to this obvious tyranny that is unfolding, but you may wonder how can it be that there are still people asleep? The answer is TV, mainstream media and Hollywood propaganda being controlled by CIA. This remnant of un-awakened people will now have to wake up to avoid a horrific end-game scenario now clearly primed to unfold in the near future. The strategy has intensified, it's now or never for many Americans. Wake up or die (of cancer or other disease) or perhaps wake up or lose your freedom. This American experiment will ultimately be a disastrous and tragic story with a likely horrible ending for many people. The penalty of ignorance will soon be felt and is already being felt by many. Nonetheless the Hollywood celebrity CIA assets continue to sell ignorance to the American people as ignorance is the lifeblood of the new world order. Keep everyone stupid and kill off and demonize those that are awake- their strategy is crystal clear. "The disease is brief and self-limited for most children, and the treatment is entirely supportive." That's right, after recovering, those that contract the disease are then considered immune for life! Great, isn't it? Immunity for life? This is what government is protecting you from. They apparently don't want you to have immunity for life unless they profit from it. Government wants you to roll over and let them stick their antigens inside your body so that you form anti-bodies to THEIR antigens, risk spreading the disease in the process (in the case of Measles "LIVE virus" vaccine) and then HOPE you are immune. This is like trading 'definite' immunity for 'hopeful' immunity and demonizing anyone who doesn't pick the 'hopeful' immunity. "The World Health Organization will start large-scale testing of an experimental Ebola vaccine in Guinea on Saturday to see how effective it might be in preventing future outbreaks of the deadly virus. The vaccine being tested - VSV-EBOV - was developed by Canada and is now licensed to Merck. A second vaccine - one developed by U.S. National Institutes of Health and GlaxoSmithKline - will be tested in a separate study as supplies become available." Remember Problem-Reaction-Solution? Does anyone see the obvious ominous threat that is coming to all of America in the name of "public safety"? This is what happens when you give up your individual freedom in the name of the public good. 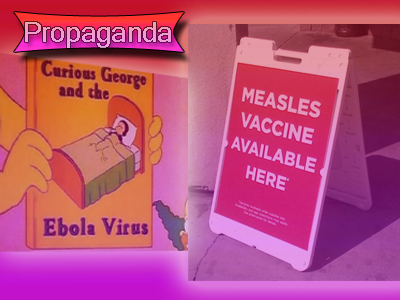 What few realize is that they are using the Measles vaccine hysteria to set up the stage for full-on forced vaccination of their upcoming Ebola vaccine. With the vaccine industry already caught spiking Tetanus vaccines in Kenya with sterilizing agents, the vaccine stage now stands as a prime tool for the longstanding depopulation agenda long admitted by Bill Gates himself. Problem Reaction Solution- It will take little effort for the globalist terrorist to release Ebola again into the public, work up the 24/7 Ebola stories (like they did in 2014) and then create legislation to forcefully vaccinate everyone. The 2014 Ebola scare may have even been a drill for the real scare. Those that refuse will be exponentially demonized if not outright arrested or attacked. Its is thus not difficult to imagine that potentially, this one issue alone could trigger full-on revolution, violence toward health care workers, and enough chaos that could justify martial law. The controllers know that Americans will not go for medical tyranny yet they continue to play this card even handing the task to Hollywood puppets to push the agenda. I believe this is an ominous sign of things to come. We all knew things were going to get worse before they get better. Be ready for what is coming, be informed, help educate others and remain positive and hopeful. Remember, the evidence against vaccine safety is established and very compelling and only healthcare ignorance, scientific fraud and protection of mega-profits is keeping the deception going. There are many ways to expose this medical tyranny blueprint, pick one and run with it. The same way that military all take an oath to defend the constitution, likewise medical doctors all take an oath to do no harm. It is also against medical ethical principles to forcefully treat a patient. This principle is as old as medicine and any doctor (regardless of any old or new government laws) who goes along with forceful treatment is violating their oath and is violating medical codes of ethics. The issue is not about whether vaccines work. Vaccines can be a great tool to control disease if used properly. The issue is about ethics. Know that in modern medicine ethics is highly emphasized and violating a patients basic rights is at the heart of this matter. Anyone can research a pharmacology book and confirm that there are no medicines or vaccines available in these modern times that are so flawless that they justify forceful administration. Almost every single drug and all vaccines have dangerous unwanted "side effects" and drawbacks associate with them, enough to make an argument for why a patient might choose to not receive that treatment. Naturally the state will hold that the claimed "safety" of the public is more important than individual choice and humanity will have to continue demonstrating that governments version of "safety" is not safe at all, and hope that someone listens. Finally, remember that the proof is all there and ultimately we are up against disinformation, the CIA and its mainstream media and Hollywood mouthpieces. For this reason is it up to all of us to spread the word. Educate those we know about this topic and do everything you can to inform those that don't understand what is happening. In the end 'Truth and knowledge' will clash against 'Lies and propaganda', and like all other government conspiracies the truth will come out in what Arthur Schopenhauer called the three stages of truth. First they ridicule you, then they violently oppose you, then you win. We are now in the first stage of ridicule. When the Ebola vaccine is ready I expect the 'violent opposition' will begin. If we make it past this stage, only then will we win. Will you be ready?